Nine years. Seems impossible… That is how long my husband and I have been splitting our time between Canada and Panama, spending six months of each year in both. But we’re getting closer to our dream of making Panama our forever home. Our first foray to Panama was in 2008, when we went on a fact-finding vacation. It stole our hearts right away. Not just for its beauty, but for its practical benefits, too. Not even taking the fantastic Pensionado discounts into account, the cost of living is considerably less expensive than in Canada. Yes, prices have increased somewhat each year but then, they have in Canada also. Even taking the U.S. exchange into consideration, Panama wins, hands down. 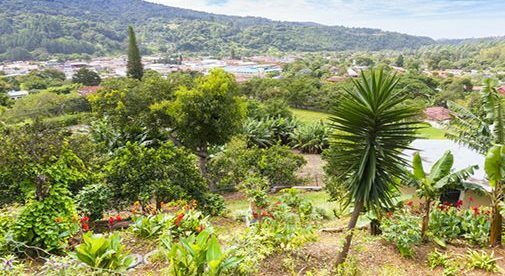 We own a 1,800-square-foot home in the Chiriquí province, complete with three-quarters of an acre of land backing onto a creek and covered in beautiful flowers and fruit trees, and an almost 1,000-square-foot covered terrace. We purchased this property for less than a quarter of what we would have had to pay in Canada. Furniture and a vehicle were included. In Canada, property taxes for a similar property, depending on the part of the country and the area, would be at least $2,000 per year. Here in Panama, thanks to the property tax exemption put into effect by a prior administration, we pay $100 per year. All utilities are considerably cheaper as well. Insurance in Panama, such as vehicle and house coverage, is approximately half the price it is in Canada. Groceries, entertainment, and clothing are all cheaper. The only items that are comparable in price to those back home are North American imports. Internet is a bit cheaper here and is fast and reliable. I’m a freelance writer and have never had a problem doing research or emailing clients. The climate in Panama alone makes it all worthwhile. I have vehemently hated snow and cold since I was a child, and that feeling has never changed throughout the years. While my friends were outside gleefully sledding, skiing, and building snowmen, I was inside curled up in a chair in front of a roaring fire, dreaming of being in a warm, tropical country, soaking up the sun and dipping my toes in a warm sea. Fast forward to now, and here I am. No more winter. Ever. Granted, Panama has its yearly rainy season but, in our experience—aside for a few weeks when the rain gods get very serious about parting with their moisture—the sun shines each morning just long enough to allow us to do a bit of yardwork or run errands. Then the rain comes in the afternoon (warm rain, I must add). We just sit and relax on our covered terrace and watch it pour for an hour or two then all is calm again. There is no need for a jacket unless you live at the higher elevations. In the dry season, I adore waking up each and every morning knowing that it will be another warm, sunny day. No worries about what to wear. Shorts, t-shirts, and flip-flops are the order of the day…every day. So many things we experience in Panama remind us of how things used to be in Canada and the U.S. many years ago. Less red tape, rules, and regulations, and more of a common-sense approach to life. More respect for others and generosity of spirit. Opening a business or working remotely usually goes very smoothly here. Friends of ours have started a mini storage business and flea market; one began a recycling business; and several have opened restaurants or B&Bs. The opportunities are endless. The absolute number one factor that endears us to Panama is the people. We live in a Panamanian neighborhood where we are accepted without question and offered assistance whenever needed. We never feel like strangers when among these kind, friendly, happy folks. Even prior to learning Spanish (and we still have quite a way to go with that), we found ways to communicate with them. Charades and their wonderful senses of humor helped a lot. We have expat friends as well, and this laidback, stress-free lifestyle has permeated their lives as it has ours. Those who are impatient with the relaxed “mañana” attitude might have trouble adapting here, but the rest of us are here to stay. Restaurants in Panama are plentiful and inexpensive. There is international cuisine, fine seafood eateries, and small fondas set up adjacent to people’s homes. An ample plate of rice and beans, a salad, and a choice of chicken, pork, or beef for $3. Add in an ice-cold beer for under $1 and we are replete and happy. All in all, relocating to Panama was without question the right decision for us. At our age, relaxing and enjoying our quiet life is what we cherish most. We have our very own slice of paradise here. Life does not get any better than this.